We have a variety of accommodation packages available to make your stay as comfortable and pleasant as possible. Enquire about our rates and availability using the form below. The old farm dam was reconstructed into a home we fondly call the Dam Huis. It has 3 bedrooms, 2 with double beds and 1 with 2 single beds. It has a fully equipped kitchen which caters for 6. A bathroom toilet and also a separate shower. The inside braai serves to protect one from the elements at the same time a cosy fireplace. There is a dining area and a pool table for the use of the guests. DStv is available. 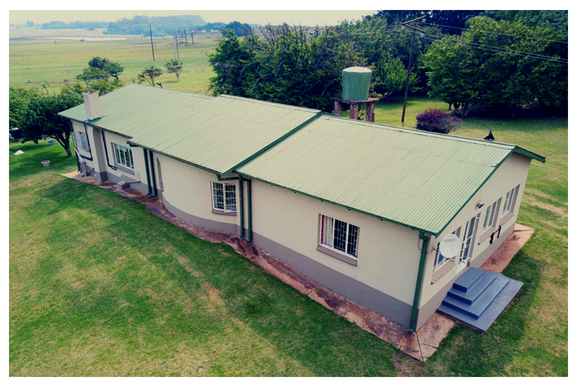 Die Stal is a great family unit and consists of 2 bedrooms; 1 with a double and single bed and the other with 2 single beds.The unit has 1 bathroom with separate shower, a fully equipped kitchen, dining area, indoor fireplace and enclosed braai area overlooking The Outpost farm and farm animals. DStv is available. Fisherman’s is a cosy, romantic cottage situated on the edge of a Wattle tree forest, overlooking 1 of the dams. The cottage has 2 bedrooms, 1 with a double bed and the other with 3 single beds, sharing a bathroom. The kitchen is fully equipped with catering utilities for 5 guests. The unit also has an indoor fireplace and an enclosed braai area. Feathers overlooks the old stables of the farm, past the farm outer buildings. The unit has 1 bedroom with a double bed and en-suite bathroom. The living area is equipped with a fireplace/braai, dining table and chairs. Feathers also has a fully equipped kitchen. DStv is available. Sara comprises of 4 dorm rooms with single beds. Each room can sleep, 6 guests. There is a communal bathroom and kitchen for all guests. A guest lounge with a fireplace. A games room with a pool table. An outside lapa and braai area. The Saras are ideal for, golfers, groups and/or team building. Outside seating overlooking 1 of the dams on the farm. Springbok, blesbok, eland and ostriches roam this enclosed area. Interested in visiting The Outpost for much needed break or event? Use the form and we’ll get back to you as soon as possible. Follow us on Facebook and receive future updates and specials delivered directly to your newsfeed.